An employee puts a lid onto a cup of coffee at a McDonald's restaurant. The recession has been good to McDonald's. As consumers trade down to cheaper, faster food on the go, McDonald's has kept up its growth during the downturn. Same-store sales rose 4.3% for the quarter that ended March 29. Profits were up 4%, to $980 million. In this economy, that's an explosion. McDonald's USA president Don Thompson insists the company has been planning the rollout's timing for over two years and that McDonald's is not specifically targeting Starbucks. "We don't need to talk about someone else to justify our business," says Thompson. McDonald's is just trying to grow, he says, by capturing share in a high-margin sector  specialty coffee  that has shown consistent growth. Whether you believe the company's motives or not, the bottom line is that McDonald's seems positioned for success. According to West, the new McDonald's drinks are almost $1 cheaper than those at Starbucks. "Is it Starbucks quality?" asks West. "I would never say that. But they're in the ballpark. And that's where they need to be." The analyst also conducts bimonthly consumer surveys, and found that over 60% of respondents said they will trade down to McDonald's coffee if the drinks are cheaper and made faster. Given the company's pricing history and the likelihood that the McCafé system will be quicker than Starbucks baristas, consumer sentiment is trending its way. 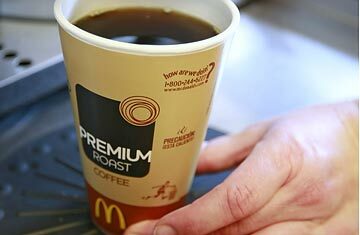 Thompson says that, to date, the McCafé drinks have produced profits in the test markets. The new national ad campaign plays off the McCafé name. In one spot, for example, a chore  ironing one's shirt  becomes a much more pleasurable "choré" with McCafé coffee in your hand. That's kind of cute, but why don't the ads highlight the company's one major advantage over coffee competitors: price? With consumer spending still weak, shouldn't McDonald's be explicitly broadcasting its bargains? "Here's what everyone implicitly understands," Thompson says. "With our supply chain and the leverage we have, the products are going to be more affordable than other coffee offerings out there. What is less implicit is the taste. So what we are trying to do is help everyone understand that, No. 1, it tastes great." McDonald's might want to stay aggressive, because Starbucks won't go away quietly. The company is introducing a grande iced coffee for under $2 this summer, and the company has said it will lower prices on basic drinks in some markets. Starbucks has also just launched print ads taking direct aim at the quality of other coffee brands like McDonald's and Dunkin' Donuts. "Beware of a cheaper cup of coffee. It comes with a price," reads one ad. "If your coffee isn't perfect, we'll make it over," says another. "If it's still not perfect, make sure you're in a Starbucks." At least one analyst, however, thinks the coffee war between McDonald's and Starbucks could be overhyped. "I think it's a bit naive to think that all of those Starbucks customers are running across the street to McDonald's," says Sharon Zackfia, an equity analyst at William Blair & Co. In a recent report, she noted that when McDonald's rolled out local TV advertising for McCafé in Michigan, Starbucks management told her that Starbucks actually saw a boost in traffic. "The obvious answer to Starbucks' problems is that the economy is weak, and 30% of its stores are in California and Florida," says Zackfia. When the economy improves, Starbucks may bounce back, with or without McCafé competition. "Just as Starbucks will always be a beverage destination, McDonald's will always be known as a food destination," Zackfia says. Thompson of McDonald's naturally disagrees. "We want to be a beverage destination," says Thompson. "For us, growing markets with great margins is the place to be." McDonald's will always have the Big Mac. But does anyone want a latte with their fries?